There are many stores in Japan where they only sell pillows. We never realized that pillows alone can make money in business. Pillow Talk, a comedy movie in 1959 featuring Doris Day, Rock Hudson, and Tony Randall is back again. There are inns and hotels in Japan where you can choose your type of pillow. Interestingly enough, according to various clinical studies done by some universities in Japan, the right size and softness of pillow can influence your health and intelligence. Do you believe that? Trivia: Did you know that elephants and giraffes use substitute pillow? Elephants gather grass and use it as a pillow. In the case of giraffe, they usually sleep while standing, but when they want to rest well, they use their own hip as a pillow. Well, let's try to find the most suitable pillow for you and me. A rich man, Mr. Sakai, was suffering from backache, shoulder pains, migraine, and stress, especially when he wakes up every morning. He thought of his pillow might be giving him problem when he saw a signboard of "PILLOW STORE" in Paris. He entered the store and bought a soft pillow, which costs 120 dollars, but the result was not as much as he expected. When he came back home in Tokyo from a long trip abroad, he immediately went to his family clinic for health diagnosis. He was diagnosed with "Occipital Neuralgia". He was suggested that its cause was due to poor sleeping position and angle. 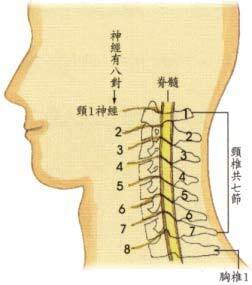 All of us have seven cervical vertebrae bones as seen in the below illustration. There are spaces between these intervertebral discs where hundreds of nerves are passing, extending to brain, arms, shoulder, and other parts of the body. It is, therefore, necessary to have a good rest around the neck to have a comfortable passage for nerves during your sleep. Failure to sleep well may create symptoms of occipital nerve pain, such as headache, shoulder pain, stiff neck, and numbness around the arms. 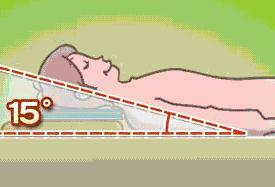 Well, what is the right angle for the head, neck, and shoulder during your sleep? Is there any clinical or scientific way to measure it? Yes, it exists scientifically. It is a place we call outer space or space where there is no gravity at all. However, it is impossible to create such space in our home. We tried to find a possible way to create such. You have heard about the Dead Sea, a salt lake on the border between Israel and Jordan. The water in the lake is nearly 10 times saltier than ordinary seawater. Even you do not know how to swim, you will be floating. Doctors believe that you can be in most relaxed position while you are floating in this kind of water just like you are floating in outer space. According to some orthopedists, a pillow positioned into a certain angle could reduce stiff shoulder, headache, and backache, and many pillow makers believe in it. Our own studies done with the cooperation of a medical university students and doctors showed the very same result. To simulate the experience with floating in salty water, like that of Dead Sea or in the outer space without gravity, the angle of pillow to neck was about 15 degrees. You can check the degree with a simple protractor you used when you were in your geometry class. We tried to analyze the structure of the intervertebral disc using CAT scanner, and the answer came to be that 15 degrees is one of the best positions compare to other angles or degrees. Of course, there are people who are more comfortable with other angles, but this is on isolated cases. How about the hardness of the pillow? Use an ordinary bath towel that have just the right hardness. We do not recommend using a very soft pillow like that of feather or sheep fur. Just a simple cotton pillow is the best in our experiments. What is the main reason of tossing and turning in bed at night? When you sleep in face up position, the body pressure is well-balanced and have a good blood circulation. When you sleep in your side, then the body pressure is one-sided. 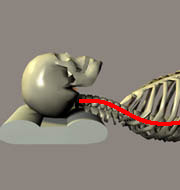 Temperature of the bottom side rises higher, and then the blood flow will be unbalanced. To correct the body temperature and blood flow, the brain will send signal to toss and turn the body to properly balance the blood flow. Now, you understand why your body toss and turn during sleep. Naturally, if the body tosses and turns while sleeping, the body loses its energy for it, and you will feel tiredness when you wake up. Tiredness appears as headache, stiff neck, backache, and stress. Well, let us make a sample pillow for good night sleep, which may even stop snoring. An old hardened pillow, thickness of about 1 to 1½ inches, rolled with a new bath towel will do. Height of the pillow should be about 15 degrees to your neck. With this position, most people sleep well and get healthier than ever before.